This year’s FLOW Northside Arts Crawl brought more than just great art. Organizers promoted healthy eating as one of the main messages of the festival. The event, held on July 26, transformed over a mile and a half of West Broadway into a dynamic and culturally diverse artistic spectacle. The art crawl was comprised of 25 sites and featured 300 visual and preforming artists from the Northside community. The arts festival had its common sights, such as art installations, live mural paintings and free Pedicab rides. 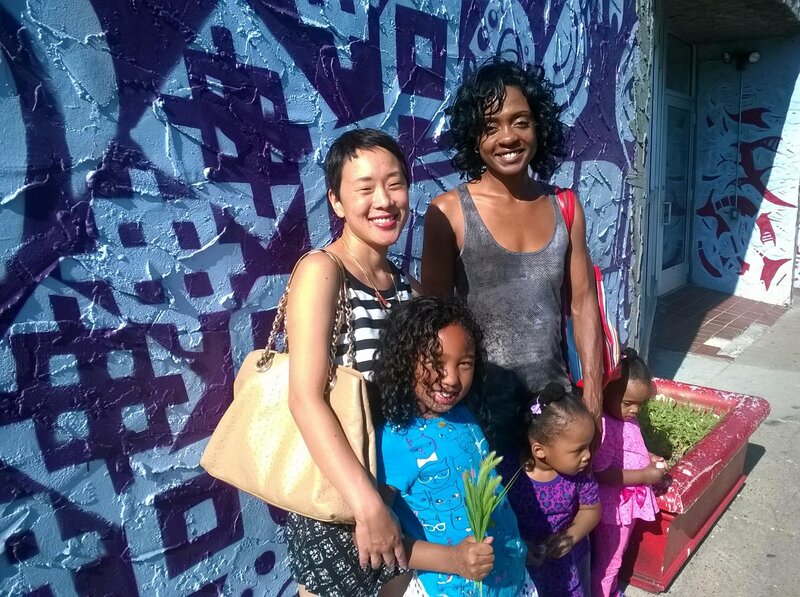 But unlike most art crawls, it also provided access to healthy, locally grown fruits and vegetables, which organizers said was an intentional push to encourage healthy eating in an area that has historically had poor access to fresh produce. The group hosts lectures, workshops on spoken word and hip-hop, and conducts cyphers (a group freestyle of poetry preformed in a circle). They performed these cyphers throughout the day in front of C and J barber shop but they also focused their talks on the importance of nutrition and handed out healthy snacks. The social justice nonprofit Emerge handed out old plastic bottles repurposed into flower pots and encouraged event goers to start their own gardens at home as a sustainable solution to getting access to healthy foods. The plastic bottle flower pots were created by high schools students who teamed up with members of Emerge as part of an art project that aimed to encourage community members to start thinking about their eating and recycling habits. FLOW’s messages this year reflects the same efforts the Minneapolis Health Department has been making recently to close the widening disparities in produce consumption seen in North Minneapolis compared to other areas. As part of the department’s continued fight against diabetes and obesity caused by unhealthy diets, MHD has given particular support to businesses and organizations on the Northside that encourage healthy living. Appetite for Change is one of those programs and they hosted a variety of visual and performing artists during the crawl at their soon-to-be headquarters on West Broadway. It’s important that the community comes together to generate creative ideas for art just as much as the more concrete ideas of growing vegetable gardens, Hollomon said, and Appetite for Change hopes to implement some of the ideas generated from the community that day into their future programs. Bedlam Theater performing artist Farrington Starnes expressed his desire to cultivate positivity out of all the negativity surrounding the Northside communities, at the crawl, especially concerning the stereotypes of African Americans. Regardless of how FLOW fueled its participant’s minds and creativity, the reception of the art crawl has been overwhelmingly positive amongst attendees. Dozens of participants flocked to the KMOJ stage to see the performances of national headliners. Several families lingered at the Juxtaposition campus with their children. All in all, the community grew a bit together as it planted the seeds of redefining unity.